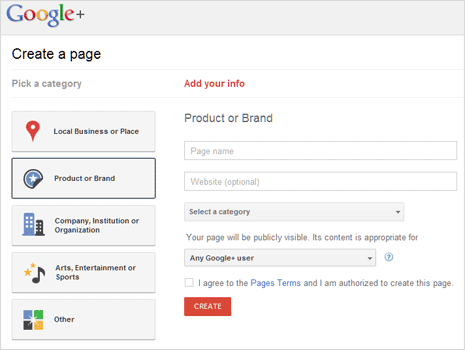 If you are a blogger, famous personality, businessman – how about using powered of Google+ to promote your brand. Similar to creating fanpages on Facebook, now you can create dedicate page for your blog, website, brand, favorite personality on Google+ Plus website. Making pages on Google+ is simple and straight forward process with only requirement of having an active Google+ account. 1. 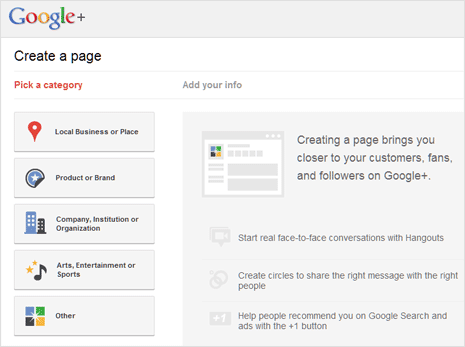 Open create page webpage on Google+ website. Login using your current Google+ account details. You should see “Create a page” displaying categories and general information like “Creating a page brings you closer to your customers, fans, and followers on Google+”. 2. Available category listing include: local business or place, product or brand, company, institute or organization, arts, entertainment or sports and others. For making official page for blog or website click “product or brand” option to proceed. 3. Then page name and website URL. Also, select “website” option from ‘select a category’ drop down box. 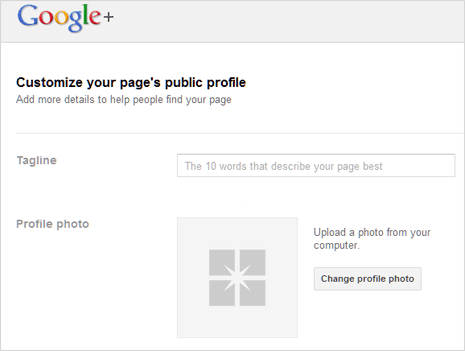 Select the visibility option for your page among: any Google+ user, 18 and older, 21 and older and so on. 4. Click to check “I agree to the Pages Terms and I am authorized to create this page” and then click “Create” button. Your page is ready on Google+ website.